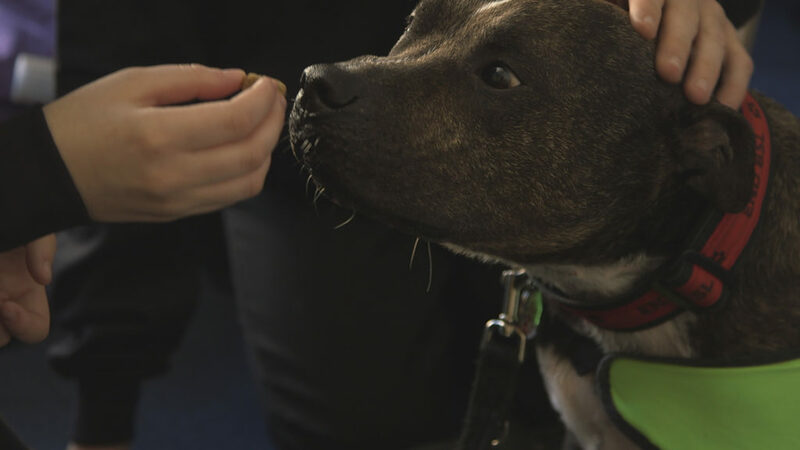 Staffordshire Bull Terrier Bruno is the dearest companion to Belinda, who has had Bruno in her family since he was a puppy. 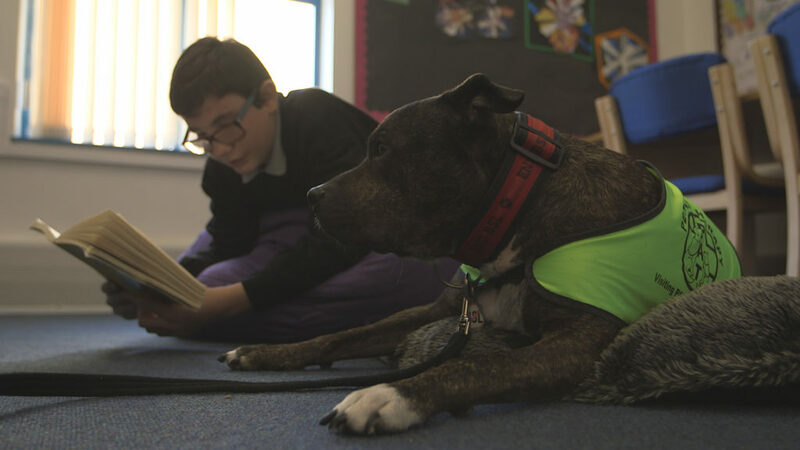 Not only does he make her life complete, Bruno also is a Therapy Dog for people in need. He visits children with learning difficulties, the elderly and soldiers recovering from Post-Traumatic Stress Disorder. One day whilst out playing, Bruno falls awkwardly and his hind legs are paralysed. 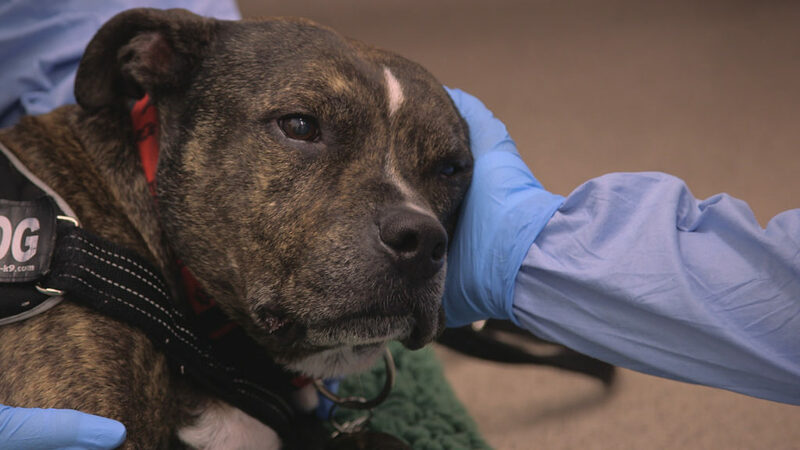 Bruno is rushed to Fitzpatrick Referrals as an emergency patient by a concerned Belinda to see what Professor Noel and the team can do. Noel examines Bruno closely and identifies that Bruno has almost no feeling in his hind legs. Early diagnosis points to a problem within the spine, but Noel won’t know until they have undergone CT imagery. Bruno is taken to CT and MRI for further investigation. When the imaging of Bruno’s spine comes back, the results reveal something they did not expect to see. It’s not a fracture, but a large tumour growing on his spine. It’s a terrible blow for Belinda, who’s already lost her father and other members of her family to cancer. Noel discussed with Belinda the options Bruno has, but Belinda is resolute, she’s not giving up. She asks Noel to operate to remove the unknown substance from his spine and test whether it is what they suspect. Bruno is prepared for surgery and Noel successfully removes the problem compressing his spine. With further tests, Noel identifies that this particular tumour is very rare – Haemangiosarcoma. Only twice before has this been recorded in the spine. While the cancer may have been removed, Noel explains that it is likely to be metastatic – that there may well be cells still in the body that are affected. 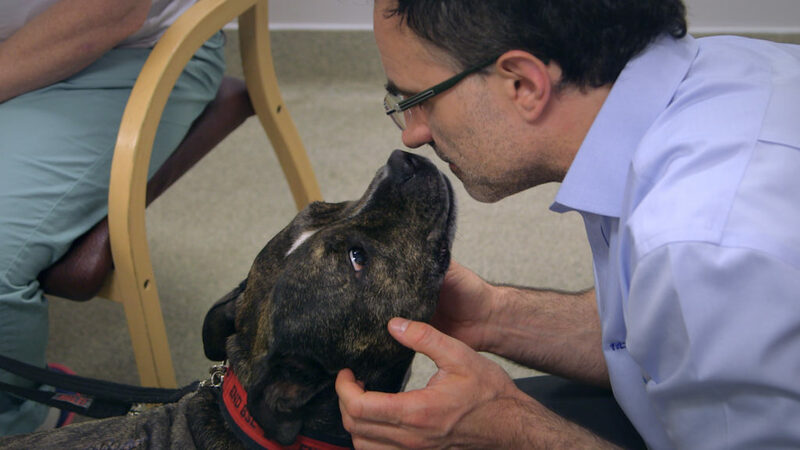 Bruno was put on a course of chemotherapy to keep the bad cells at bay. 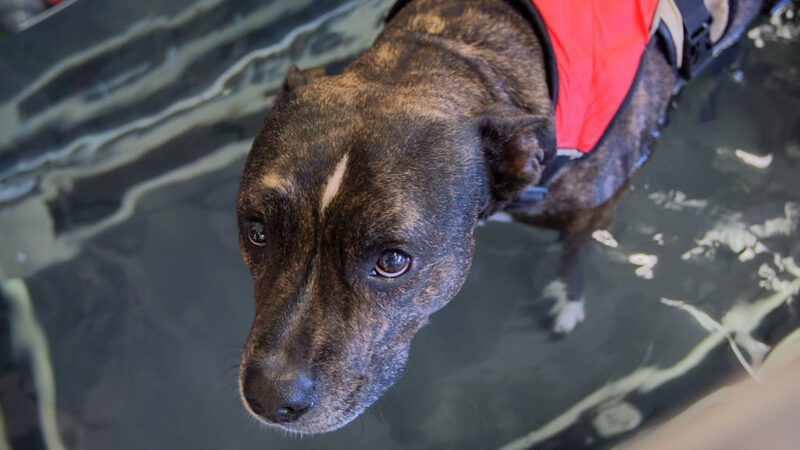 He also had some Hydrotherapy on the Underwater Treadmill to help him get strength in his back legs again. Four months after the operation and Bruno is well enough to go back to work and visit all his friends who look forward to seeing him! Belinda knows that cancer will ultimately take her friend, but she’s glad she’s done all she can to give him the best chance for a full life and enjoys every minute with him.